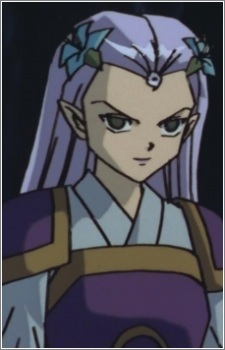 Hari is a character that appears only in the movie Inuyasha the Movie- Affections Touching Across Time, the loyal servant of the main antagonist of the movie, Menomaru. She appears to be very fond of her master, willing to do almost anything for him. She is not above taunting her opponents, as seen in her final fight against Sango. However, these taunts and her general arrogance ultimately proves to be her downfall; after underestimating the bond between Sango and Kirara, she is ripped in half by Sango, and although the attempt to kill her seems to be unsuccessful, Menomaru decides to claim her soul and she dies. Hari's abilities include the power to control anyone by means of a special spell, which she used on Kirara. She also wields two blades which normally appear as innocuous leaves, but in her hands, they transform into large swords. With this weapon, Hari is able to fire off a large wave of red energy in the form of a cross, which appears to be quite powerful as they caused much destruction when used in battle, although not quite powerful enough to withstand Sango's Hiraikotsu. Otherwise, the swords can be used as normal melee weapons. Another of Hari's abilities is the power to use the flower petals from the flower that she keeps in her hair as projectile weapons. She simply plucks off one petal then hurls it at the opponent. The single petal then transforms into multiple blades of blue or yellow energy which cause violent explosions upon impact.